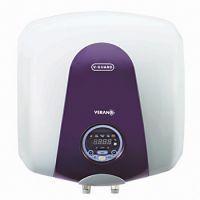 This 15 liter Storage geyser water heater is ABS Body material with 5 Star Rating (BEE). This water heater comes with Unique EPAC Tank which is Engineered Polymer Anti Corrosion coated inner tank that makes it suitable for hard water too. The Automatic Temperature Alert Connect the water heater to the app and get an automatic temperature alert on your smartphone. To Recieve updates and possible rewards for V-Guard Verano DG 25 please sign in. To Recieve updates and possible rewards for Geyser/Water Heater please sign in.